"Anthocyanin" which is a kind of the polyphenol is included a lot and the blueberry is said that it is good for the prevention of the eye trouble. Moreover, it is an antioxidative effect of the polyphenol and there is protective efficacies such as cancer, cardiac infarction, and apoplexies, too. The anthocyanin of a lot of coloring matters that exist in a true of the blueberry black, purple part is a glycoside element that the anthocyanidin is related to sugar and the sugar chain as an aglycon among anthocyans. This is a kind of flavonoid, and the antioxidative effect and the effect of the eyesight recovery are known well. 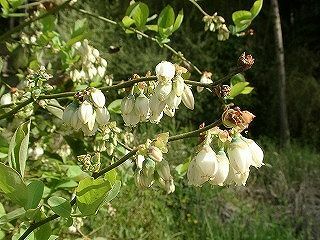 In the blueberry, cultivation is comparatively easy one in the fruit tree. It doesn't grow so much, and the stepladder etc. are not necessary for the size of the tree even for the prune either. The blueberry can be grown without strongly disinfecting it to the sickness. The kiwi, and in the fruit that can be eaten without disinfecting it, isn't it not neither a blueberry nor persimmon? The blueberry is planted in the place where it gets much sunlight, and the drainage is good. However, the watering is done or moisture plants it in a lot of places that are a little because it needs a lot of moisture. Because the blueberry likes acid soil, it plants it in sand that mixes the peat moss. Compost and rice bran are done a lot so that the soil may become acidity. Never scatter the lime. The blueberry can grow the pot. The pest doesn't attach easily, and it is possible to harvest during year 2-3. Because it is weak to dryness, and likes acid soil, the peat moss is put and grown in the pot cultivation. Because it is possible to increase it even by the cuttage, let's challenge. It is easy to raise the rabbit-eye kind in the warm region. It seems to be easy to raise the one of a strong rabbit-eye in the warm region. I hear that the rabbit-eye can harvest a lot even if fruits are a little small and was excellent in the hot tolerance and the low temperature resistance. The kind of fruits large, qualities good, high bullish factions seems to be weak to the heat and dryness though it is strong in the cold. Moreover, hitting the low temperature long when the floral bud is grown might come to be necessary and to grow in the warm region the defect. All blueberries of high bullish faction that I raised have withered within 2-3 years. 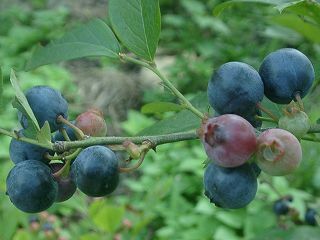 It is an appearance of the blueberry in the first ten days of May. A lot of flowers of a white, lovely bell shape had adhered. The tree of the blueberry has been done besides this tree because of the intense heat in recent years though planted ..how many... It seems to have fallen into the shortage of water. The watering of every day withered it was not possible to do and was regrettable because it planted it in the country. It cannot know whether a juicy place is a little better. A remaining tree is about one-meter in height power and has extended the branch to all sides. The height of the tree and a true size and the color are fairly different because of the kind. The tree of the blueberry planted several years ago grows, and the truth has been ripening to dark blue-black since about the beginning of August. The sweet and a tart taste extends to the mouth if only ripe what is taken like the blueberry hunting and it puts it in the mouth. Catching only small ripe grain taking care not breaking off of the branch though the leaf is avoided becomes considerably serious work. It seems to be related that the blueberry hunting becomes popular in the farm for tourists to hanging of time in the harvest very. The blueberry is chiefly put in the one that the LG21 yogurt was cultured and I am eating though it is also good to eat the blueberry as it is. It is the one like taking the place of sugar. It is possible to eat delicious though it is not so sweet. The material and how to make are as follows. As many as blueberry 250g, sugar 100g, 1/4 lemon fruit juices, and brandies (Even other distilled liquors are available)5g. The blueberry is quickly washed in water. It puts in the pan of a stainless steel and a porcelain enamel as it is, and it puts it on the low flame. Sugar, the lemon fruit juice, and sake are put in, and the fire is strengthened a little when boiling. When it condenses so as not to scorch it by the medium flame, and lye comes out, it removes. About ten minutes are condensed and the completion. Please ..hardness of the favorite.. condense it. It shuts off the heat in a suitable point because it becomes hard when cooling. The blueberry jam with delicious even only blueberry and sugar can be done. We will recommend being made by all means when a lot of blueberries were able to be harvested very easily. Blueberry 1kg, the crystal sugar 200-500g, and the white liquor 1.8 liters are put in the bottle and the material is mixed. It comes to be able to drink in 2-3 months. It becomes like the grape juice if it sweetly makes it. The truth of [yamanasubi] ([natsuhaze] and ericaceous [sunoki] belonging) made me the fruit wine. It can be done that the wax tree ([natsuhaze]) is similar because it is just like the blueberry in summer.